Easy to set up, you can put Connect to work, right out of the box. 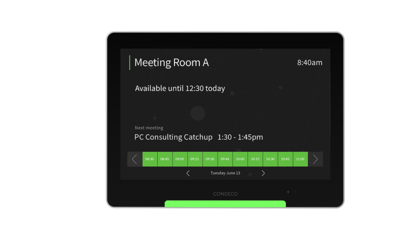 Connect supports your existing MS Exchange or Google Calendar* scheduling software. Our cloud-based reporting gives you all the insight you need to make better decisions about your workspace. RFID card check-in and auto room bump features give you more space to choose from. With subscription options to suit your needs, Connect scales from entry to enterprise. Every screen includes on-demand 24/7 support from Condeco experts.